"If we want our children to be good Catholics, then we must be good Catholics. living and loving our faith. The formula is so easy, and yet so hard to apply consistently. even with God’s grace. Fortunately, there are ways to make up for our parental shortcomings. 1.) Leave denial at the door. 2.) Talk with your teens about sharing their online passwords. 3.) Befriend them on social networking sites like facebook. 4.) Establish rules and limits to cell phone and internet use. 5.) Join an online parenting group. younger ages than ever before, and few are getting serious conversations at home about what good relationships look like. contact with dangerous people, they may be speaking inappropriately with their friends, or they may be the victim of an abusive relationship. The truth is, we need to know. content of your child’s profiles. 4.) Set boundaries for the times and places that teens can be on the cell phones and the internet. Teens are communicating digitally almost constantly throughout the day. 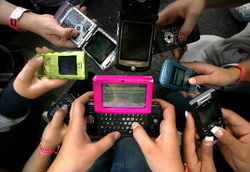 Some teens report texting over 1,000 times during a typical school day. Some report messaging thru the internet until 3 or 4 in the morning. This kind of behavior has to be monitored. If they are in their room after 9pm, there is no reason they should be texting and messaging into late hours of the night. 5.) Build an online parenting community. You won’t be the only parent enforcing these rules. You won’t be the only parent online with your kids. You won’t be the only parent knowing your teens passwords. You are not the ‘uncool’ parent if everyone is also doing it. 6.) Be the example. The conversations are not easy, but your teen is better off unhappy than unsafe. Ultimately, violence prevention starts in the home. Parents are still the most influential part of a teens core values. to expect a far darker reality. In a lively question-and-answer format, Good Discipline, Great Teens considers issues ranging from curfew to drugs to backtalk and equips parents to give their teens a safer, more stable adolescence, and character and virtues for a lifetime. by Lynda S. Madison, Ph.D.
Today's Catholic teens are hungry for finding meaning and direction in life. These articles from Loyola Press will help to bring the Good News of Jesus to Catholic teens. Children often feel insecure about themselves and their social acceptability.Consequently, they are extremely vulnerable to pressure from their peers to fit in. Students who develop high self-esteem and healthy values are less likely to give in to peer pressure to drink or use other drugs. In order to build your children’s self-esteem, it is important to develop a relationship with them that is based on mutual respect. Make time for your child. Find an activity you enjoy doing together and pursue it. Be active with your child in school activities. Listen, really listen. Learn to draw your child out about things that are important to him/her, and listen with your full attention. Talk, really talk. Talk to your child about applying the catholic values and virtues of honesty, responsibility, temperance, modesty, integrity as they relate to the media, abstinence, tobacco, drugs and alcohol, personal goals, and relationships. Share your faith and spirituality. Teach your teen to pray about issues. other drugs or be sexually active. Teach refusal skills. Discuss lines and comebacks or role play situations that challenge the child to act. Tolerate differences. Freely talk about topics where all people do not have the same opinion. Give teens responsibility for their own problems. Let your child experience the consequences of his/her own behavior, even if these consequences might be embarrassing or uncomfortable. Teach your children to accept and learn from their failures. Young people need to understand that the only failure is in not trying. Mistakes are not failures. Mistakes simply provide us with new information that can help us to succeed. Develop a parenting style based on mutual respect, while remaining the parent. Choosing a Catholic College The Cardinal Newman Society seeks to fulfill its mission by assisting and supporting education that is faithful to the teaching and tradition of the Catholic Church; producing and disseminating research and publications on developments and best practices in Catholic higher education; advising students, alumni, trustees, campus officials, faculty and others engaged in renewing and strengthening the Catholic identity of Catholic colleges and universities and Church-affiliated ministries at non-Catholic colleges and universities.